The story of the Quarry Gardens at Schuyler is getting around, at least in the local area. It was written up as a “before” article first in Blue Ridge Life in the January of this year, then again in the Nelson County Times and the Charlottesville Daily Progress, the Rural Virginian (and I heard rumors of a Waynesboro paper also) in the summer of 2015. There probably won’t be that much more of that until towards the projected opening in Spring of 2017. So in the meantime, I plan to run this Progress Report on our website, updating it once a week or so if there is anything to report. Rather than start at the beginning, however, I’ll begin “in medias res” as of July 2015. The main subjects of attention at the start of July relate to constructing the infrastructure of paths around the quarries (including vehicle roads, walking paths, conservation trails, stairways, bridges, rest areas, boardwalks, etc. 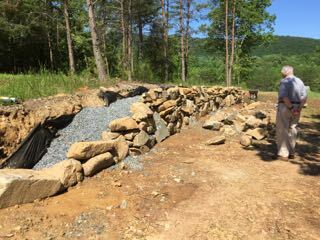 ), identifying and cataloging the native plants that already exist here, building a viewing overlook, defining with stone walls the parking area and a place for gatherings at the top, and bringing electricity to the Quonset hut/admin building. 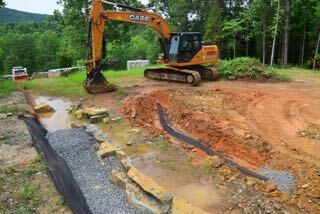 Work on most of these items began in June, but persistent rains have made progress difficult. We’ll catch up on the flora and fauna in later postings, but here are some photos of the infrastructure going in. Frankie Graves and I puzzling over how to place a 15-ton seating rock that will be built into the viewing overlook. No 3, Two “entrance” rocks above the viewing platform, with the two seating rocks in place. No 4, Frankie Graves digging foundation pier holes for the concrete platform. No 5, What happens when rains persist. Note that one hole is empty and another, less than a foot away, is full—from the same rain. No 7, Here, we are digging the trench through almost solid rock and setting the conduit to bring electrical service from Salem Road to the Quonset hut. As of now, all 900-ft are finished and awaiting an electrician to set the breaker box so Appalachian Power can pull the wire through it. The route of the first quarter of the walking path, from the viewing platform along the top of the south quarry face down to the south quarry overlook has been laid out, and construction started. Nos. 8 though 10, Beginnings of actual construction. No 11, An artifact we discovered atop a big rock at that overlook. We have no idea what it might have been used for. It’s a bound wooden box about 2-feet square by maybe 15-feet long and looks as though it was rigged for lifting, though it’s not substantial enough for moving quarry block. Perhaps someone who knows will recognize it and tell us about it. Incidentally, in this overlook area Devin Floyd, our consulting naturalist, last week spotted a rare, smooth green snake (non-threatening, a couple of feet long) whose sighting would be the first reported in Nelson County.